On Friday, Indian shooter Tejaswini Sawant opened India's account for Day 9 in the ongoing Commonwealth Games 2018 with a record-breaking gold medal finish in women's 50m Rifle 3 Position at Gold Coast. Tejaswini registered a total 457.9 and India's 15th gold medal in the 2018 CWG in Australia. Following the ace Indian shooters, Seonaid McIntosh of Scotland took home bronze with his decent 444.6 effort. Tejaswini Sawant also scripted history at the Games and set a record 457.9 points to take home gold. Indian shooter Tejaswini Sawant opened India’s account for Day 9 in the ongoing Commonwealth Games 2018 with a record-breaking gold medal finish in women’s 50m Rifle 3 Position at Gold Coast. While Tejaswini Sawant claimed gold, her counterpart Anjum Moudgil on the other, won silver in women’s 50m Rifle 3 Positions event at Gold Coast. For the gold finish, Tejaswini registered a total 457.9 and India’s 15th gold medal in the 2018 CWG in Australia. Tejaswini, who is no stranger when it comes to winning medals for India also shined on Day 8 where she won silver in 50m Rifle Prone event. By adding another medal to her name in the Commonwealth Games, Tejaswini Sawant also scripted history at the Games and set a record 457.9 points to take home gold. While Sawant reached heights and broke the CWG record, her compatriot (Anjum) on the other scored 455.7 points. Following the ace Indian shooters, Seonaid McIntosh of Scotland took home bronze with his decent 444.6 effort. Earlier, Anjum clinched the top spot in the qualification standings with a CWG record of 589 points. Sawant qualified at the third position with a score of 582. Singapore’s Martina Lindsay Veloso was second on the qualification ladder with 584. 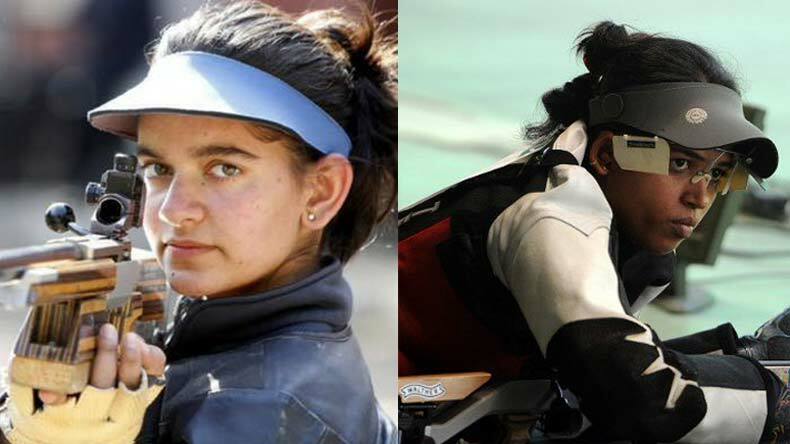 “Delighted to know that Tejaswini Sawant & Anjum Moudgil have won GOLD & SILVER respectively in Women’s 50m Rifle 3 Positions,” President of India, Ram Nath Kovind congratulated the Indian shooters on Twitter. “5th Gold for India in #GC2018Shooting !! 🎉🎉With a CWG record of 457.9, Tejaswini Sawant clinches a 🥇in women’s 50m rifle 3 position. 2nd medal for her at #CWG2018 after a 🥈in 50m rifle prone,” Rajyavardhan Rathore tweeted.